Pure Storage: Why All-Flash storage is the next Critical Step for PACS and VNA Solutions – CT Link Systems, Inc. Presently, Healthcare organizations are becoming more reliant on their enterprise imaging systems to improve their overall quality of service they provide to their clients. However, as growth in size and scope continues for imaging, those responsible for constructing and managing the Picture Archiving Communication Systems (PACS) and Vendor Neutral Archive (VNA) solutions will have to handle various new and potentially difficult challenges. 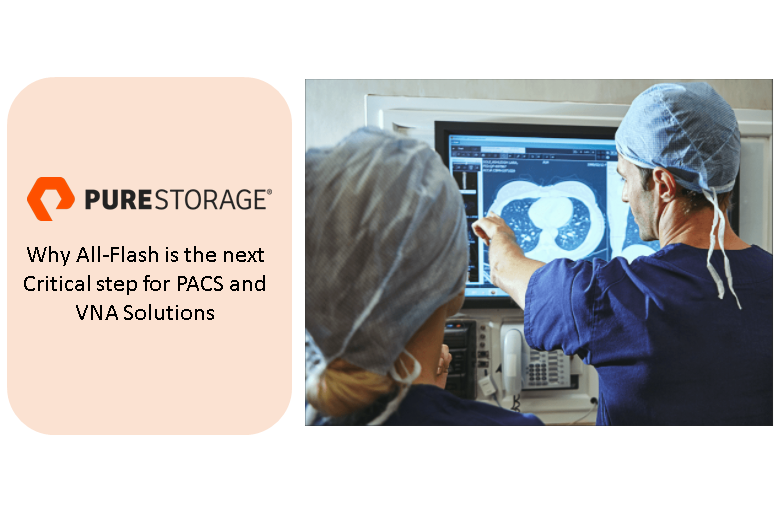 However, within these challenges lies opportunities to improve patient care with storage upgrades to support the PACS and VNA solutions. With major advances in both imaging technology and information technology, clinicians now have the means to use a broader range of images from across the entire health system to make better and informed decisions when it comes to their clients care. Also, as the system continues to expand in size and scope, more advanced analytics will be available to improve the progress of treating patients. This means administrators of PACS and VNA play a bigger role, making sure delivery of performance to the point of care and meeting more stringent requirements for images, including availability, business continuity and compliance. This means dealing with capacity growth while making sure that images are readily available and not stored in an archive that is inaccessible or unable to meet the performance requirements of the image and viewer. They must also align their systems to their customer needs, be it current or future customers. An all-flash array will typically mean faster deployments, simpler scaling and less complex ongoing management and maintenance. With the right all-flash platform, administrators can use automation to eliminate a wide range of manual tasks— with no need to ever undertake an expensive and risky forklift upgrade. This is valuable from a number of perspectives. In terms of performance, using a single tier of high-performance storage means that images are always available and on storage that can ensure quick and easy access. In terms of manageability, a single tier eliminates manual processes and the myriad tasks involved in managing the cache. In terms of cost effectiveness, a single storage tier means no need to manage archives and older storage platforms that are becoming obsolete. All-flash storage is clearly the future for PACS and VNA systems, so there is really no point in waiting. With all-flash storage, PACS and VNA systems can deliver major improvements in performance, agility, availability and manageability. With the right solution, administrators can stay current with the latest technology without having to replace infrastructure and migrate applications, images and data. In addition, flash storage is the only storage platform that can deliver the performance required for modern initiatives such as big data analytics, machine learning and radiomics. To learn more about PACS and VNA solutions with Pure Storage, you may check this link here. If you want to learn more about all-flash storage, you can visit our Pure Storage product page or contact us directly at 893-9515. ← HPE Awards CT Link with the “Simplivity Deal of the Year” award!